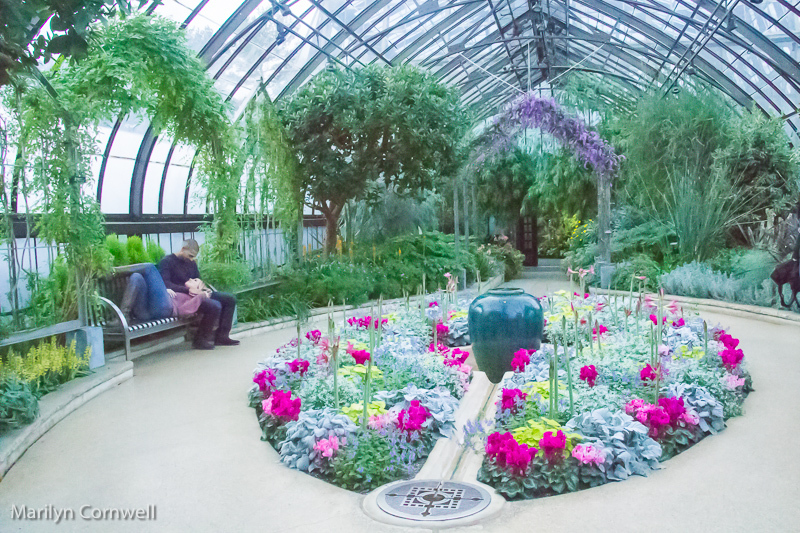 Today's pictures show Longwood Garden's Orchid Festival. Their docent information package said there were 6,000 orchids on display. 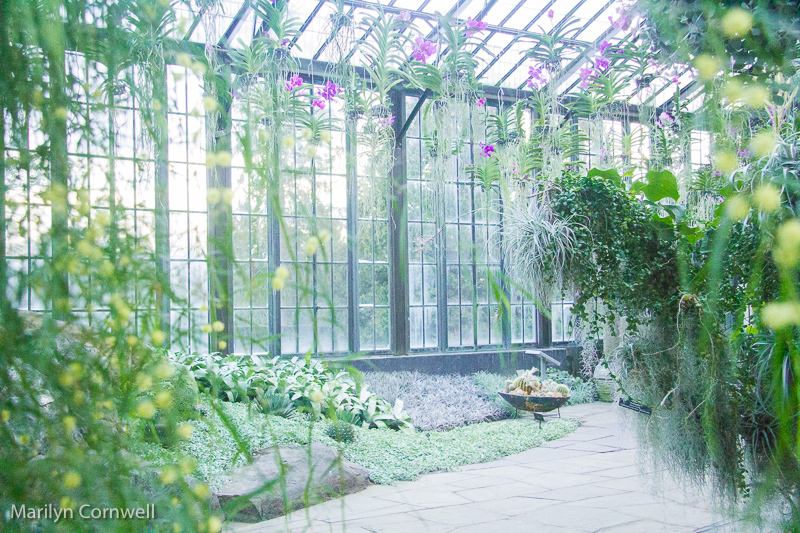 Arches were formed of 600 orchids and the huge hanging orbs contained 200 orchids. 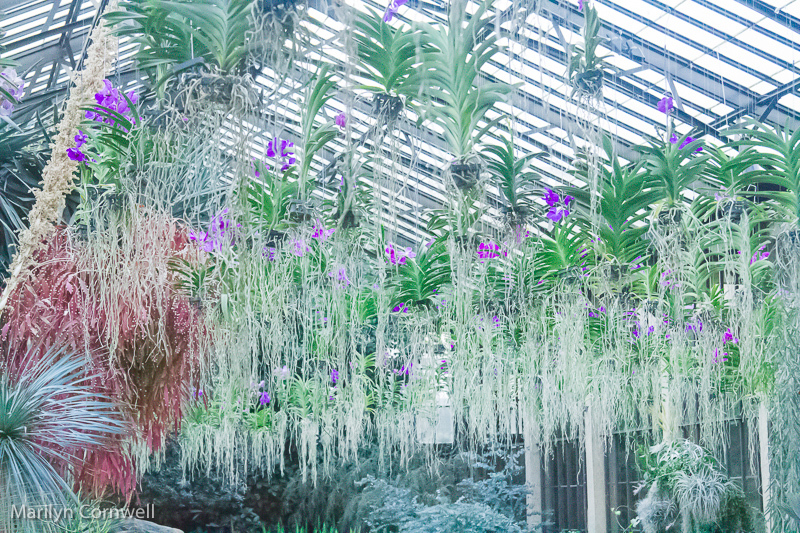 This silver greenhouse had 200 hanging Vanda orchids. I have a mere 2 in my greenhouse - and one is purple like these - an intense and rich colour. In the Mediterranean greenhouse, I was double lucky - the arches had blooming Hardenbergia - a delicate purple flowering vine that looks like miniature wisteria. This is the first time I've seen them blooming. The second 'lucky' was the couple doing engagement poses - this pose was perfect. You can see the photographer's camera bag at the far right - I'll crop that out later. Do you know how many orchid species there are? There are 25,000 - 30,000 different species of orchids - that's just species. At Longwood the Orchid House displays 200 - 300 of the 6,200 hundred orchids at Longwood. They and the Asteraceae family are the two largest families of flowering plants. And you likely know that Vanilla is a climbing orchid. Since the introduction of tropical species into cultivation in the 19th century, horticulturalists have produced more than 100,000 hybrids and cultivars. I would guess that orchids are a hybridizing dream. We don't think of orchids as an ordinary plant in our northern gardens. Our orchids are in woodlands and don't adapt well to our gardens. Yet they have adapted to every corner of the world - the only place that orchids don't grow is on glaciers. And it seems strange that the world's richest diversity of orchid genera and species are to be found in the Arctic Circle and in southern Patagonia. With this many flowers in one family, it won't surprise you that there is a National Orchid Day. It's on April 16th.